Ghost Bike on the Corner of Monterrey Boulevard and Lewis Street in San Jose two weeks ago. I had to assist in the birth of two ghost bikes recently. You know what a ghost bike is: it’s a bicycle painted entirely white chained to a location where a cyclist was killed by a person driving a motor vehicle. And yes: the word you want to use is ‘killed.’ I’m not going to call these things accidents. Dropping a 15mm wrench on my foot is an accident. These are more. Anyway, the way both events happened was I learned someone wanted to build a memorial while volunteering at Good Karma Bikes. The searches began with me scouring the racks of recently donated bikes. Good Karma Bikes does not want bicycles that are beyond repair or bikes that originate from a department store - the former for obvious reasons and the latter because they’re made of cheap materials. But some make it inside anyway, and my eyes find them first. Stupid questions enter my head. Did this person like mountain biking more than road biking? Were they short or tall? Would they be insulted that they are being memorialized by a rusty Roadmaster instead of the classic - but irreparable - Schwinn? In the end I just pick out the largest bike I can find. Hopefully drivers will notice it and remember to slow down and cyclists will see it and remember to take as much ownership as possible over their personal safety. I also hope motorists reading the subsequent news coverage - if there is any - will ease off the accelerator as well. 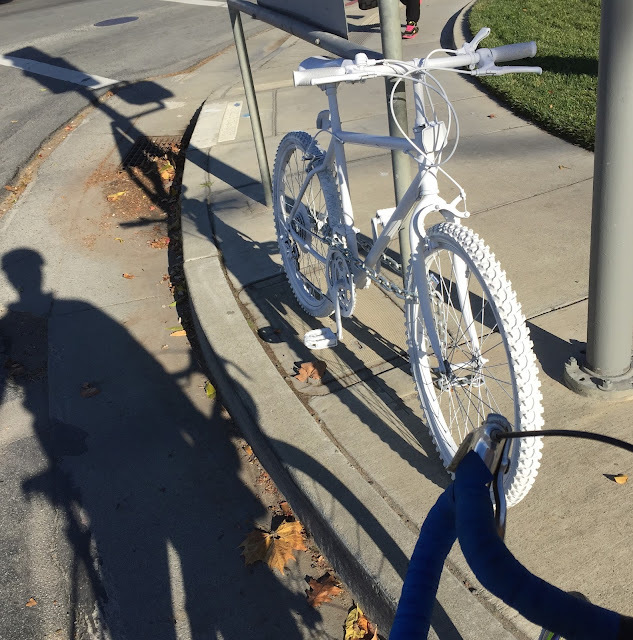 But the stories, like the one about the killing of Jeffrey P. Donnelly in Palo Alto and the the killing of Rosamaria Ruminski in San Jose - are short and almost never venture into the bicycle user’s life or the emotional aftermath of their death. I have yet to see reporters interviewing shattered families a year or more after a needless traffic fatality, or hold city leaders accountable when a deadly intersection remains unchanged months or years after the blood has been washed away from the pavement. Ghost bike in New York City. But the news stories about driver error appear quickly forgotten. A reminder of that was seen this week another San Jose Mercury News article: California now wants a licensed motorist to be behind the wheel of all self-driving cars so they can take over if something goes wrong. I can only shake my head and ask: why isn’t this the other way around? I want self-driving technology in every car ready to take over from any human driver who stupidly doesn’t slow down when facing the sun, who chooses to blast through an advance green, and who chooses to go ten to twenty miles an hour over the speed limit. I’m still hopeful the days of the angry driver, the distracted driver, the careless driver, the tired driver are numbered. But until the clock really starts running down, motorists need to drive slower. You’re not a professional driver on a closed course. You’re an amateur driver on a crowded course - and your vehicle is a whole lot deadlier than mine. So remember: if you’re driving so fast that you don’t see the cyclist or pedestrian you’re driving too fast. You can wait an extra four seconds to get where you are going. Use the gas pedal less and your eyes more and maybe everyone can get home to their families this holiday season. And if you're riding in the car with someone with a heavy foot - call them on it. Thanks for reading and thanks for riding. roadmaster mountain bikes are the best in any kind of road. Most of the time, I use this mountain bike. And I suggest you all to ride on this bike. It's really enjoyable bike.